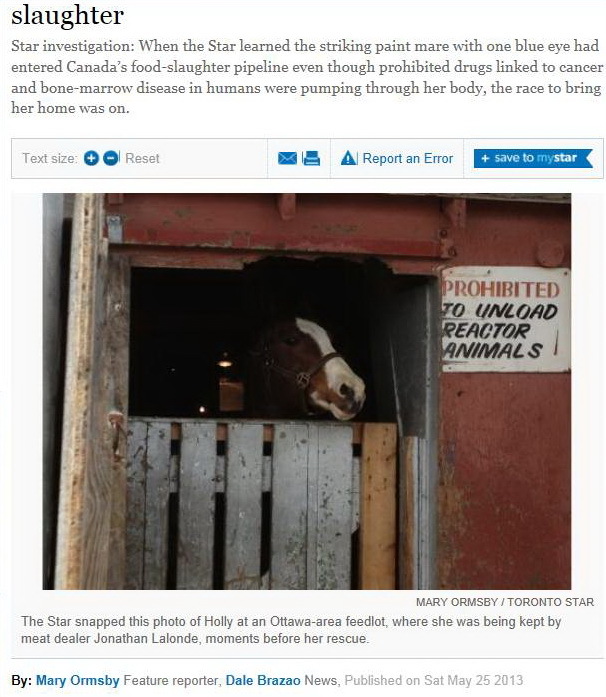 Star investigation: When the Star learned the striking paint mare with one blue eye had entered Canada’s food-slaughter pipeline even though prohibited drugs linked to cancer and bone-marrow disease in humans were pumping through her body, the race to bring her home was on. Here’s a video showing Holly being taken from the kill buyer’s lot. Excellent investigative procedures and at last Holly is safe. Thank you for the information. Who would want to destroy such a rare beauty, let alone one filled with drugs to begin with> Poor Holly went through a lot like the heart-rendering story of Black Beauty for Anna Sewell which broke my heart as a child. Enjoy your life Holly – run, run, run free.